The Alloa Tower is a large free-standing tower keep of the 15th century set within a small park within the town of Alloa. The site does not seem particularly strong today, but was defended by the swampy lands of the Forth floodplain, and the now all but vanished Brothie Burn flowed straight past the Tower to the east and south. 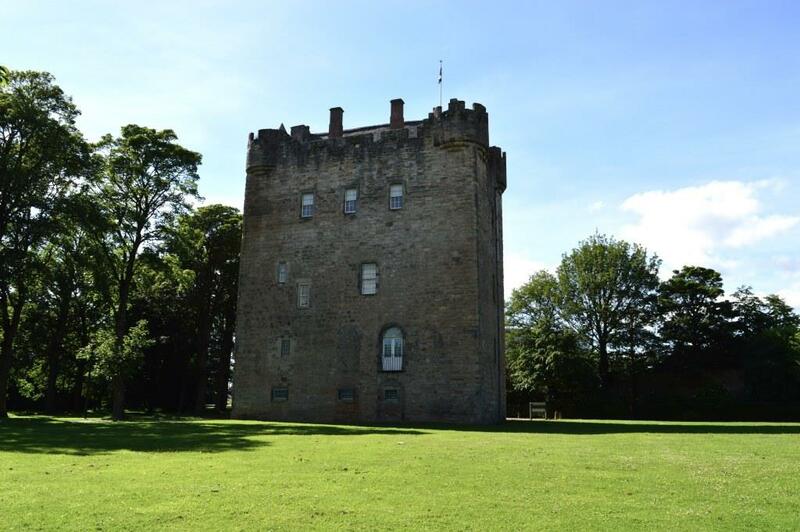 In the 14th century the castle at Alloa was probably a strongly defended manor with a courtyard, the main residence developed into a larger hall-house of three floors later in the century, and later into a taller five-storey building before it was rebuilt in its current form as a tower-keep in the 15th century, completed in 1497. It was part of a defensive line of castles along the north bank of the Forth, and was granted by King David II to Sir Robert Erskine in 1360 in thanks for faithful service in the face of the Stewarts. Previously the castle had belonged to the Crown. The tower has been repeatedly modified over the centuries, and very little survives inside of the 15th century work. It is said that the parapet is original, but the open bartizans are consistent with a later date. In particular the large number of windows inserted (several of them being false windows) has changed the appearance markedly. Inside, the tower is divided into two areas at ground, first and second floor level, and a notable feature is that one of these spaces is round, the other rectangular. The upper floors are rectangular, raising the intriguing possibility that the round space is a shadow of an earlier round courtyard tower. Alloa remained the property of the Erskine family, who went on to become Earls of Mar, and were forfeited for their support of the Jacobites in 1715. However the family were permitted to purchase the estate back, and built a substantial mansion alongside the tower. This mansion was destroyed in 1800 by fire, and Alloa House, demolished in 1959, was built nearby to replace it. The Alloa Tower, largely abandoned during these later years, has been restored and is now run by the National Trust for Scotland.